Jewish community takes on numerous religious, social, and cultural tasks that it relies on donations to fulfill. Therefore members often make donations for the honor of reading from the Torah in the synagogue. Since Jews cannot write on Shabbat and the holy days, bands mark the already noted donor names and the amount of the sum. This community records the donations in stuiver (five cent coins) and guilders. In everyday life, the Hebrew term she-nadar (“he who donates”) became the Yiddish word shnodern. 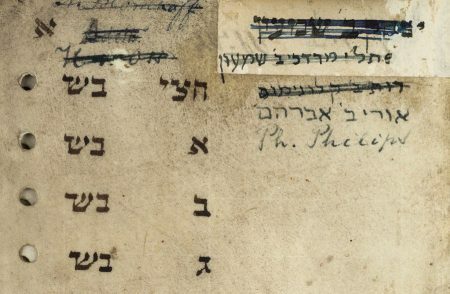 Shnoder Book, early 20th century, Jewish Community of Tilburg, Netherlands, parchment.